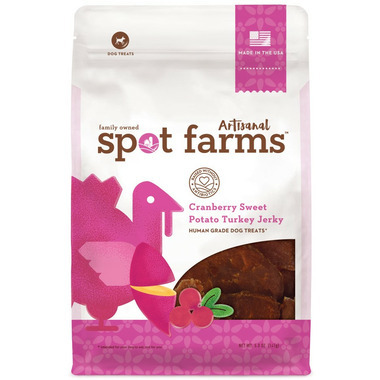 Spot Farms Cranberry Sweet Potato Turkey Jerky is a delicious treat for your dog which features slow roasted, all natural turkey blended with healthy sweet potato and antioxidant-rich pressed cranberries. Spot Farms believes knowing where your dog’s food comes from is just as important as knowing what’s in it. That’s why they go right to the source, working closely with small family farmers who raise their turkeys with care. Your dog will taste the difference in every bite. Treat your dog to incredible flavor!